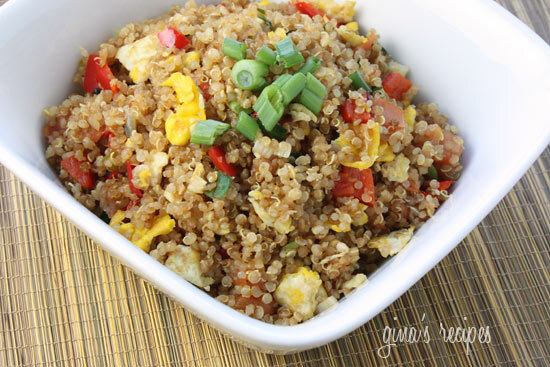 Quinoa makes a great alternative to rice in this quick and easy stir fry. I often make a large batch of quinoa, and keep the rest in my fridge to use throughout the week (it freezes great too). You can easily make this a main dish by adding chicken, shrimp or beef. In a nonstick wok, spray oil and add the eggs and salt and cook a minute or two until done. Set aside. Add the remaining oil to the wok and add the scallions, peppers and garlic. Saute about a minute, add the tomato and stir in all the quinoa. Add soy sauce and stir to mix all the ingredients. Keep stirring a few minutes, then add cooked scrambled egg. Adjust soy sauce as needed to taste and mix well another 30 seconds. Just found this and look forward to making it this weekend. I see many references to fish sauce but don’t see it in the recipe. How much should be included? Made this tonight as I just got a huge batch of organic quinoa from Amazon. Delicious. I added a little bit of fish sauce and a couple of dashes of sriracha for some heat! Yummy, great idea. ???????? Do you know how many Smart Points this would be by any chance? I added tofu and some sesame oil – so filling!!! tried this recipe tonight i skipped the crushed peppers, but followed the recipe regarding the soy sauce and the fish sauce. However I found this to be somewhat bland, is there any way to make it really spicy? This might be a dumb question, but if I don't have a Wok, can I use a regular pan? Would I need to adjust any of the process? Thanks! This recipe is amazing! Instead of fish sauce, I used a little bit of hoisin sauce. Everyone in the lunchroom at work was commenting on how good it smelled. Next time I plan on adding carrots and peas. Thank you for all the great recipes! Gina,would you recommend Sriracha sauce in place of the fish sauce, or some other hot sauce? The fish sauce has way too much sodium for my husband's diet. Just a thought. Can't wait to try this! Thanks! Sure, that would give it a nice kick! Hey, just a cool idea for quinoa…when washing it, I use a permanent coffee filter basket to drain it–it's a great size, and the little grains can't escape. Thanks for your amazing site! Accidently stumbled on to quinoa and LOVED IT! Made this recipe and it is SO GOOD….and easy to make! Looking forward to making more of your amazing recipes!! This is absolutely wonderful. Tried it tonight, will be making it again! I am so glad I found your blog! I made this recipe last night and it was amazing! Thank you so much for including all the nutritional information, as well as WW points, in your recipes. I'm going to tell all my friends about this blog. You have another faithful follower! Please tell me you know about Bragg's Liquid Aminos…I will never go back to regular soy sauce, you should definitely give it a try! This recipe made me a believer (in quinoa that is!). I switched up the veggies to make it bit more traditional (carrots, peas, green onions, and bamboo shoots and added cut up chicken as well) but otherwise made it as directed and it was fantastic. I think I even prefer it without the rice. Amazing! This is my FAVORITE recipe!! First time I tried it I was amazed at how much like Chinese take-out fried rice this tasted, but I thought it could use more veggies. Next time I made it I just added broccoli, peppers, mushrooms, etc. I love this recipe! So easy, healthy AND tasty!! Just made this for lunch. Delicious. Thanks so much. I am new to your site and love all your recipes and pics. Maybe it was the fish sauce or the fact that I used freshly cooked Quinoa but this was gross. Delicious! Do you think it would freeze well? I'm looking for easy to grab meals for university, since I go until 10 at night twice a week, and this is so delicious and satisfying! Quinoa can be bought anywhere that sells groceries but if you have an Ocean State Job Lot near you, I recommend you buy it there. It is much much cheaper and they often have the prerinsed variety. I used red bell pepper. Sorry for the confusion. This may be a silly question….but by red peppers do you mean bell peppers or hot peppers? I just bought a box of this yesterday so I will be trying this recipe out tomorrow for dinner. Thanks so much Gina! any ideas on calories for this recipe? looks tasty!!! I just made this and it was delicious! Even my finicky 2 year old scarfed it down. I omitted the fish sauce, since I didn't have any. Another site suggested mixing a little lemon juice with the soy, if you didn't have fish sauce. I tried that and hopefully that achieved the flavor it was suppose to. Regardless, it was good. 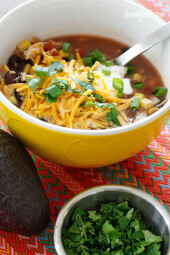 Do you know how many ww+ points are in this recipe per serving? Tried Quinoa for the first time last week and was impressed! Hoping to try this recipe next week. this was awesome. i added about 3/4 cup of kale for extra fiber and added volume. really delicious. thanks! You could leave it out if it's not available by you, it is in the Asian aisle of my supermarket. You may need to adjust the salt or soy sauce. Hi Gina, I was trying to find all the ingredients to make this and am not sure what "fish sauce" is. My grocery store didn't know either. Please let me know and if there's a substitute if not available in my area. You could just leave the fish sauce out if you don't have it. I like the flavor it gives the "rice". 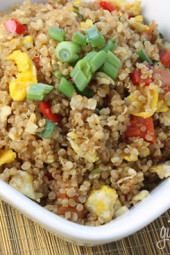 Quinoa is a high protein seed that includes all 9 essential amino acids, magnesium, iron, copper and phosphorus. It has a nutty flavor and a fluffy, slightly crunchy texture, similar to pastina. 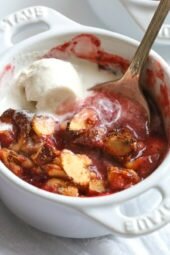 After recently joining WW, I was looking for light recipes and I stumbled upon your blog. Its my favorite place to search for recipes – that are simple yet healthy. Thanks! Wow, that looks sooo good! But all your recipes look good! I really love Quinoa but struggle to give it some variety. Thanks so much for this recipe, yum! I made the quinoa fried rice tonight and it was OFF THE HOOK AMAZING! Thanky you! Thanks for another idea on how to use quinoa! Sorry I haven’t responded all week, I am on vacation in PR and there is no wifi around. Thanks for all the positive remarks, I made everything before I left and set it up to autopost. @Lori, it really is simple to make. The possibilities of recipes it are endless! @Recipegirl, I do that a lot! where do you buy quinoa sounds delicious! I just recently discovered your site and it is always the first e-mail I open. Your recipes are the best and I can’t wait to try the quinoa recipes. Thank you so much for all your hard work. Great idea! Good way to get grains in and tons of fiber. 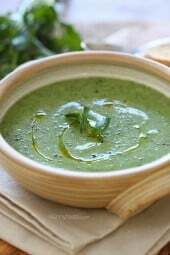 I found you searching for a soup and just wanted to stop long enough to say that your photography is simply beautiful! Everything looks so perfect and professional – it’s like looking at a gorgeous cookbook!! Quinoa is great. Even better than couscous, which is idiotically simple to make. This is a cool way to use it, too. Thanks, Gina!